Real Madrid are set to play Espanyol on Tuesday in La Liga as the season moves ahead. Los Blancos go into this game as the favorites. Real Madrid are currently third in La Liga after 25 games with 51 points. They trail table toppers and rivals Barcelona by 14 points. The only way is up from here for them. Real Madrid won comprehensively against Alaves at the weekend and will be in a positive frame of mind. They now face another sterner test against Periquitos away. On the other hand, Espanyol are currently fifteenth in La Liga after 25 games with 28 points. They know they need to keep winning games to stay out of danger. 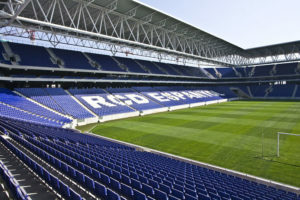 Espanyol drew with Deportivo at the weekend and should be confident going into the Real Madrid game. But they now it will be a tough task against a side like Real Madrid. So far Real Madrid and Espanyol have played each other on 49 occasions. Out of that Real Madrid have won 36 games while loosing 7 games, 6 other games have been a draw. All in all it should be a good game as both teams will give their all. Espanyol have a no injury concerns and will be at full strength for the Tuesday night game. As for Real Madrid, Sergio Ramos is back from suspension and will play against Espanyol. While Marcelo will not be available as due to injury. Also Jesus Vallejo remains sidelined. Espanyol XI : P. Lopez, Navarro, A. Martin, J. Lopez, Duarte, V. Sanchez, Jurado, Melendo, D. Lopez, Moreno, S. Garcia. Real Madrid XI : Navas, Carvajal, Ramos, Nacho, Theo, Lucas, Casemiro, Kovacic, Asensio, Ronaldo, Benzema. I back Real Madrid to win this game comfortably.